If ever there was a time and a place to look at re-localizing economic activity, it would be - here and now. This past week two more Windsor manufacturers called it quits. We lost another 600 automotive sector jobs and even worse will be the loss of the gel-caps jobs that represented some of our precious economic diversity. Both companies are owned by corporations outside of the Windsor/Essex region. Neither corporation has any reason to consider the impact moving these operations will have on our city/region or the people that will be hurt. It’s not that these plants didn’t make money, or the quality of their work was anything but top-notch. The problem was they weren’t making enough money. And that is unfair. But it will continue as long as we rely on big corporations to drive our economy. Somehow we need to take control of the way we work and earn, spend and invest. We need to keep our money and company profits in this region. The easiest local economic system I could see us starting around here would be a series of co-ops. This would allow farmers, artisans, trades people and others an opportunity to share the cost of running their business with their customers. This kind of set-up is ideal because the customers and the business operators will develop the kind of relationships that used to exist before the big-box when the Main Street merchants knew their customers and worked hard to make sure they were satisfied and the customers felt appreciated. Those relationships are missing in our world today. You go to a big-box and there is no personal service. The employees are anonymous and the people that come in are just customers/consumers. Scaling back our economic world is not much different from our built world. We really don't connect with people anymore in our day-to-day because everything is so out of proportion to the individual. We need to make that connection, to work together to raise ourselves up again. A co-operative economy would just be the beginning. As the individual businesses grew they could set-up on their own and expand and reinvest in themselves and the community. A co-op would foster the start-ups and after a while we could have a thriving local economy that, if supplemented with some new large corporate investments would make Windsor/Essex a great place to live and work again. 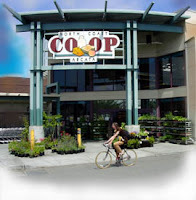 Posted by James Coulter at 1:53 p.m.
Plus, "Co-op" just sounds much more humane than "Com-pete", doesn't it? February 9, 2008 at 9:16 a.m.
February 9, 2008 at 6:51 p.m.
February 9, 2008 at 7:17 p.m.